Saturday, October 2, 1909, and the Phillies’ young third baseman, Eddie Grant, strode to the plate against the NY Giants’ ace and future HOFer Christy Mathewson in the top of the third inning of Game 2 of a doubleheader at the Polo Grounds, and laced a clean single for his 7th consecutive hit, in 7 straight plate appearances on the day. His first 5 hits (including a double) came in Game 1, off another Giants pitching star and future HOFer, Rube Marquard. The 7 straight hits in 2 games set a major league record, not broken until 1952, not matched in the NL until 1992. “I didn’t get another hit off Matty all season”, the Massachusetts-born, Harvard-educated Grant used to quip with his typical modesty, not revealing that he achieved the feat at the tail end of the 1909 season, and that he’d gotten a hit in his very next game against Mathewson, in 1910. Harvard’s Eddie Grant, the old Giant third baseman, sleeps in the forest of Argonne, only a few yards from where he fell. His grave is marked by some stones and a rude little cross tenderly reared by his men. Eddie died leading his battalion, in a desperate fight to relieve (Major) Whittlesey’s beleaguered men two weeks ago. He was commanding a company of Three Hundred Seventy infantry from Camp Upton, when the battle began. For four days and four nights, his company was part of the command which was trying to get to Whittlesey. On the morning of the day that relief was effected, Eddie was so worn out he could scarcely move. Some of his brother officers noticed him sitting on a stump, with a cup of coffee in front of him. Two or three times, they say, he tried to lift the cup, but he was so weak he couldn’t do it. Finally with a terrific effort, he gulped down the coffee, when the command came to move. “Everybody down,” to his men, without hunting for cover himself. He called for more stretcher bearers for the two lieutenants. He was calling and waving his hands when a shell struck him. It was a direct hit. Officers and men say Eddie’s conduct during the fight was marvelous. He never slept while the drive for Whittlesey’s position was on. 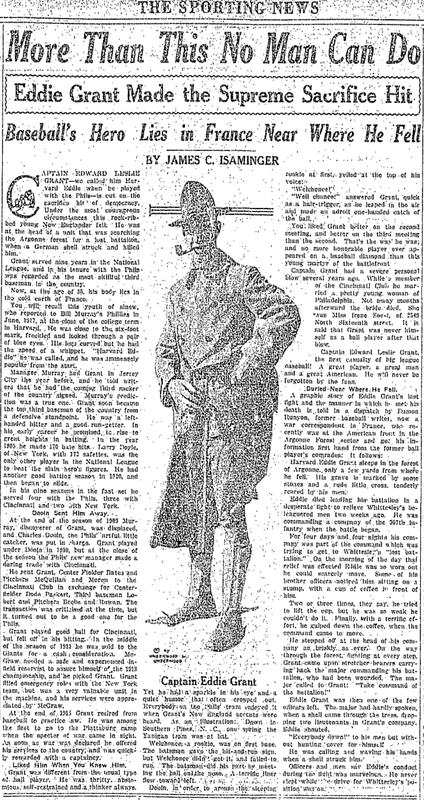 Eddie Grant would sadly thus have another footnote in the annals of major league history – he would be the first MLB player to be killed in action in service to his country. Both a baseball and basketball standout at Harvard, upon graduating in 1905, he would play on semi-pro and minor league teams as he concurrently pursued a law degree at the university (which he would also achieve, in 1909). Filling in as a local substitute for Nap Lajoie as Cleveland was in town for a series with the Red Sox in the summer of 1905, Grant went 3-8 in two games for the Naps, but quickly returned to the minors. 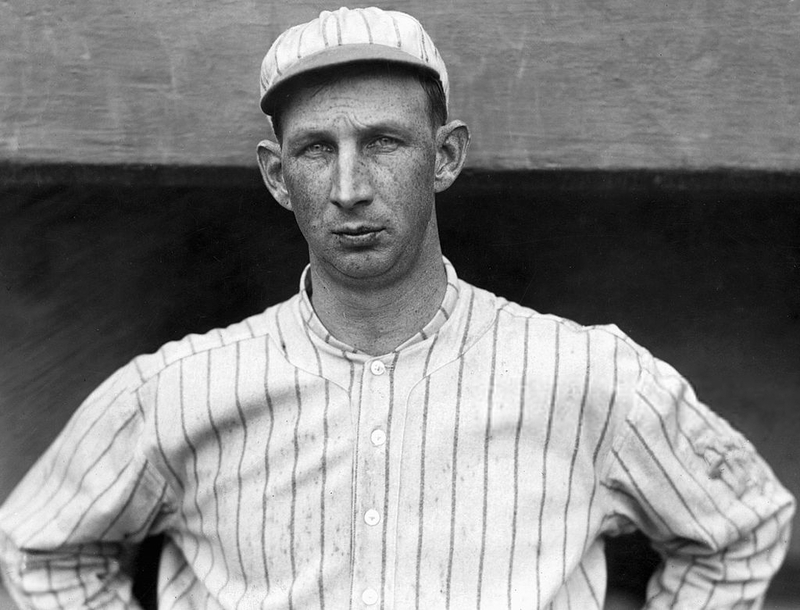 However, after leading the Eastern League in batting (.322) in 1906, he would return to the majors in 1907 with the Phillies, becoming their starting third baseman in 1908. Although an average major league hitter with little power (typical of the dead-ball era), Grant was durable and dependable, leading the majors in at-bats in 1908. His dependability would result in even better offensive numbers in 1909, playing in every game of the campaign, again leading the majors in at-bats, and also plate appearances, allowing him to finish second in the NL with 170 hits, while batting a career-high .269. Despite another good year in 1910, batting .268 and playing all but 2 games that season, he was dealt to Cincinnati in primarily a swap of third-basemen before the 1911 campaign. 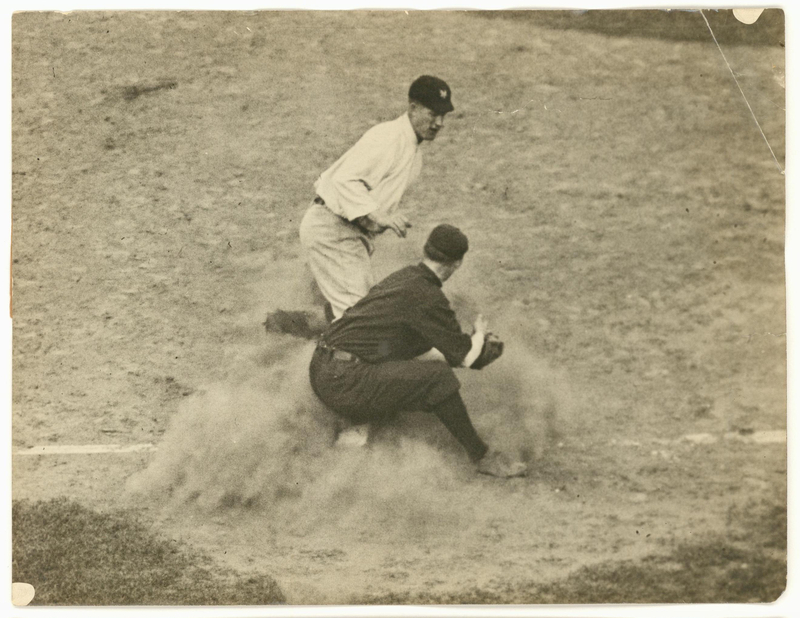 From the caption on the reverse of this photo: Blocking the runner off the base – one of the things resorted to occasionally by a wily infielder. Eddie Grant, the Cincinnati third basemen, received the throw from the catcher far to the right, on his bare hand. He hardly had time to swing around and tag Murray, the premier base-stealer of the Giants, as the latter was almost at the base. So he hurled his body between the sack and the runner, preventing him from reaching the base, which gave him plenty of time to tag Murray. 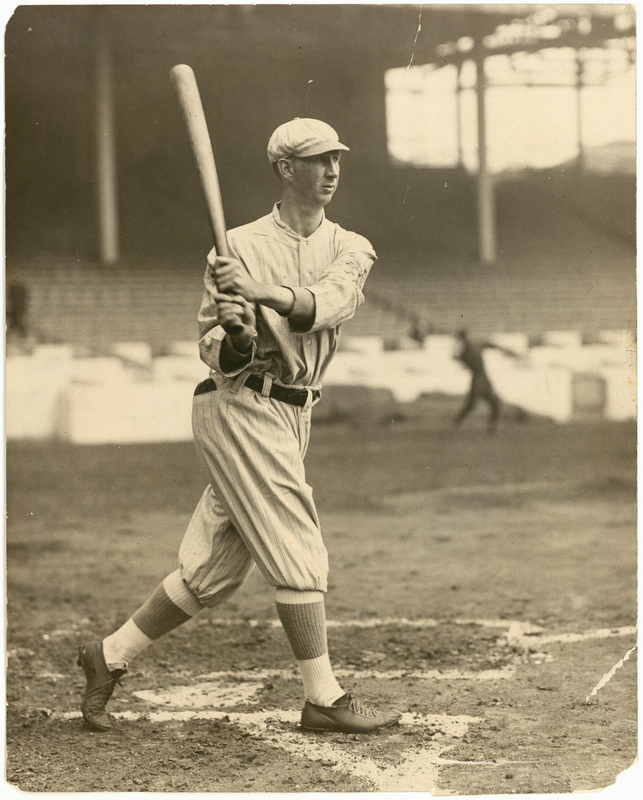 Grant slumped at the plate during his time with Cincinnati, possibly due to personal tragedy; he married Irene Soest in Philadelphia in February 1911, but she died suddenly only a few months later that November of an undiagnosed heart condition. Less focused, he was relegated to part-time status in 1912 and early 1913, but that summer the NY Giants purchased him for their stretch run. A move to the Giants offered him the chance to play in his first (and only) World Series in 1913, and he even scored the winning run in Game 2 as a pinch-runner (although as a pinch-hitter he made the final out in Game 6 as the A’s won the Series). Despite his decline, Giants manager John McGraw was fond of the savvy, college-educated Grant, and utilized him as a bench coach along with his part-time duties for the next two seasons. 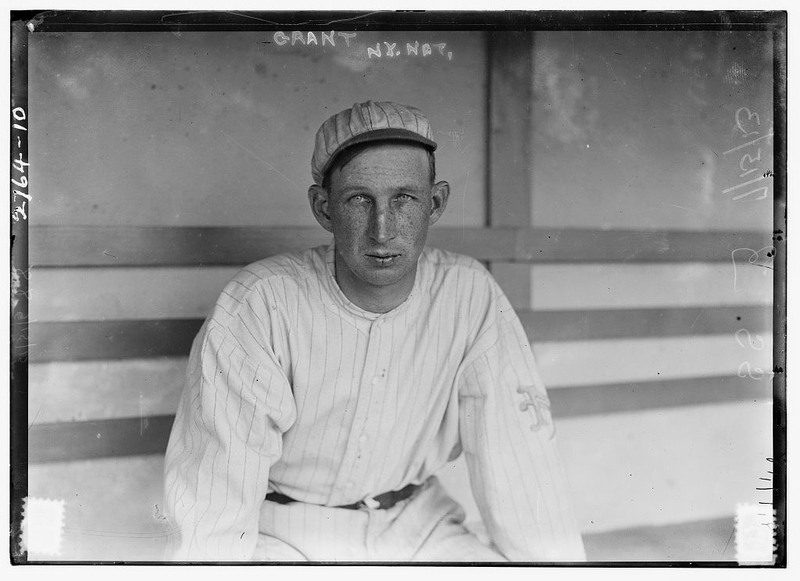 However, seeing less of a future as a player, Grant retired after the 1915 season to dedicate more time to his Boston law practice, although he also managed in the minor leagues in 1916. However, everything changed with the U.S. entering the war in April 1917. Grant immediately enlisted and signed up for officer’s training in New York. “I had determined from the start to be in this war if it came to us, and if I am not successful as an officer I shall enlist as a private, for I believe there is no greater duty that I owe for being that which I am—an American citizen”, he wrote to his family at the time. And by 1918, he was off to France as an Army captain in the 307th Infantry, 77th Division, to fight the Germans in the Argonne Forest, in what would be the final major push of the U.S. in the war. And, when his old law school friend, Major Charles Whittlesey, was pinned in by the Germans, and while during his unit’s latest rescue mission his commanding officer became incapacitated, and under heavy artillery fire, Grant was called into the game. 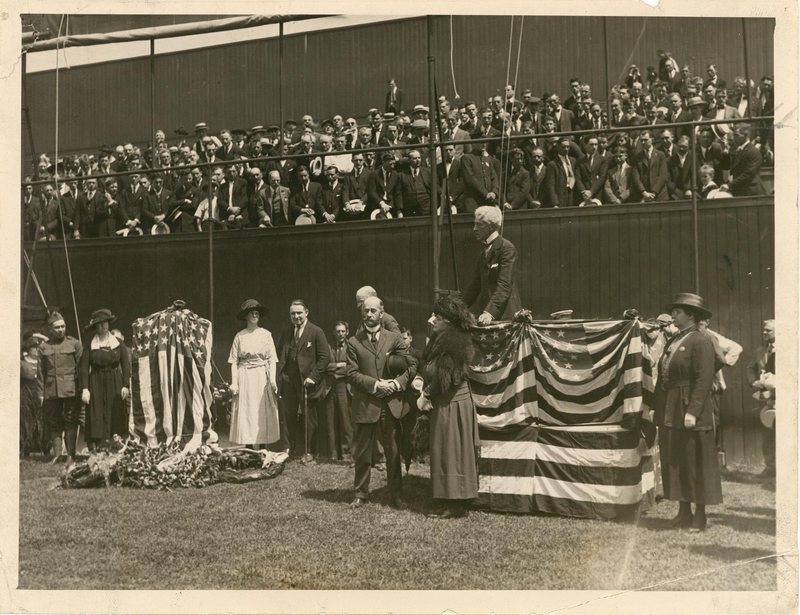 The NY Giants honored Eddie Grant with a memorial plaque, dedicated between games of the Memorial Day doubleheader at the Polo Grounds on Monday, May 30, 1921. 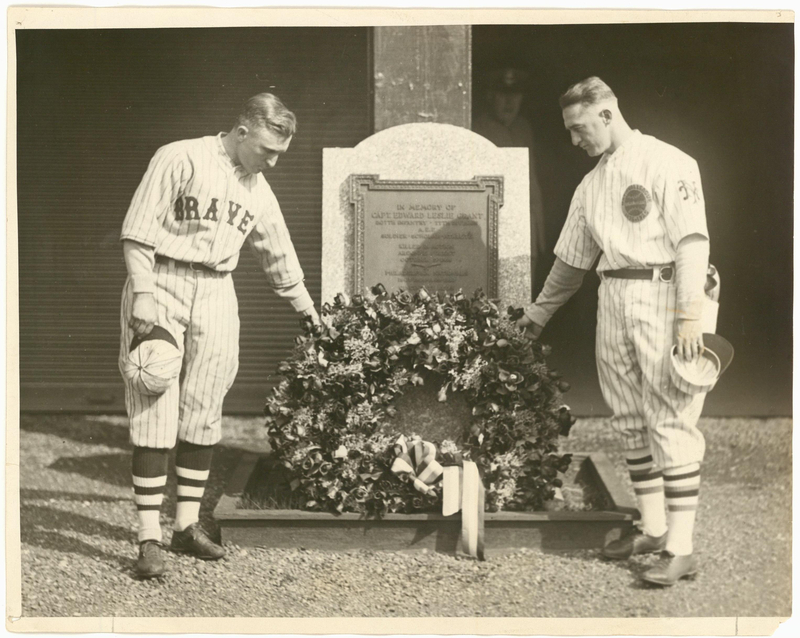 The Giants would lay a wreath on the memorial plaque every subsequent home Memorial Day, for many years. 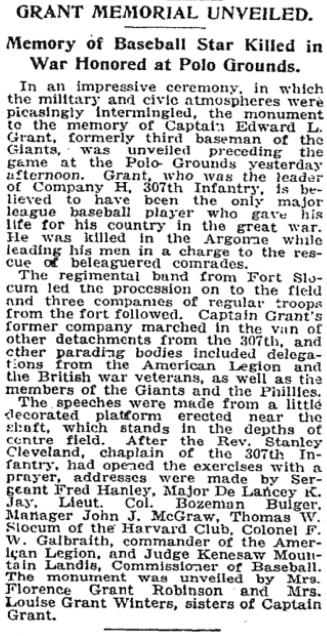 Below, a Boston Brave and NY Giant would do the honors in 1925. Interestingly, the plaque was installed in center field on the field of play, although 483 ft from home plate in the cavernous Polo Grounds. The plaque would be assured of being seen, as fans in this park would leave the game by exiting from the playing field, and through the metal gates to the sides of the plaque. 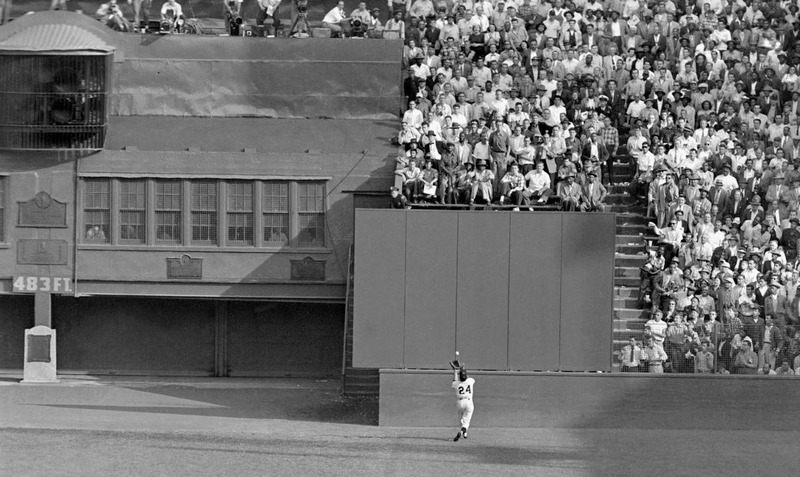 The plaque remained in place for the remainder of the Giants’ years at the Polo Grounds, through September 1957 (the Giants moved to San Francisco in 1958), and would silently bear witness to many great moments, including Willie Mays’ outstanding catch in the 1954 World Series (below). In closing, there are three prominent words describing Eddie Grant on his memorial: Soldier, Scholar, Athlete. Here’s hoping that posts like this can help contribute, in some small way, one more word equally deserving of his legacy: Remembered. Where is the plaque today? While it was claimed to have been found in a NJ attic in 1999, it appears to have been a hoax or made-up story. 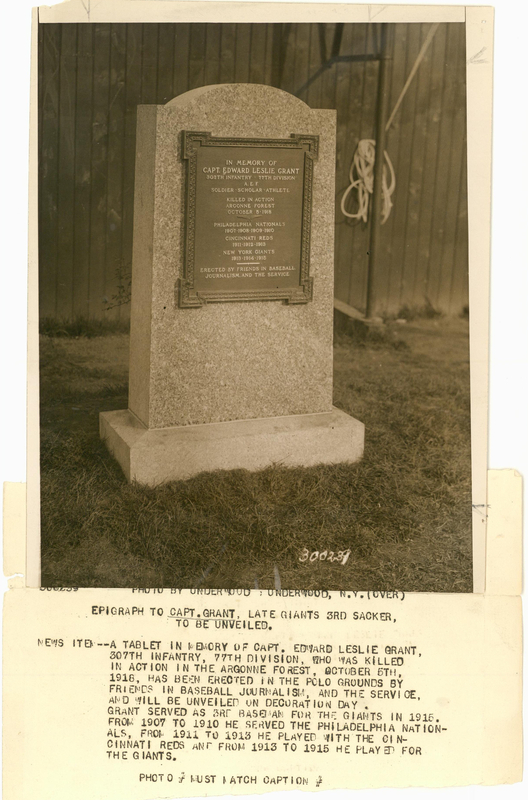 The consensus is the plaque has not been seen since it was removed by fans following the Giants final home game in 1957.